I'm looking for employment as a communications/change management specialist. View my resume. You can also see my qualifications at LinkedIn. 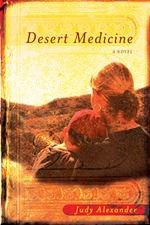 In Judy’s first published novel, Desert Medicine, a newly divorced young mother of twins who runs a plant nursery discovers the true meaning of family, growing spiritually while helping an eccentric older woman from her church. The older woman relates her own feisty, colorful search for family, beginning as an abused girl in 1930s Panhandle Texas who’s sent to live in border town Calexico with a maiden aunt who runs a home hospital. Read an excerpt. "In our skeptical, sophisticated times, it is refreshing to meet a writer who cares deeply about God and other people and who isn't afraid to show it. In this big-hearted first novel, Judy Alexander draws her characters with such loving precision that I found myself thinking of them as friends. Desert Medicine is a great read." "Not only was the book interesting, well written and thought provoking; it paralleled my life in so many ways I was sure you had been living in my house for all those bad years and "only the names had changed to protect the innocent." "Sure there were differences, some good, some bad but the over all feelings of despair, anxiety, hope, and strength were there. I’d like to think that I faired as well as Laurelle in the long run. I wish I’d learned sooner some of her lessons for my children’s sake. I was also glad to see she didn’t face some of my troubles. Again, thank you for an insightful and promising book. I’ll look forward to more books from you."